Have you ever gone canoeing? If so, did you experience the need to coordinate with the other paddler to make sure you moved in the direction you both wanted to go? Two people in a canoe, one paddles in the back, one paddles in the front. 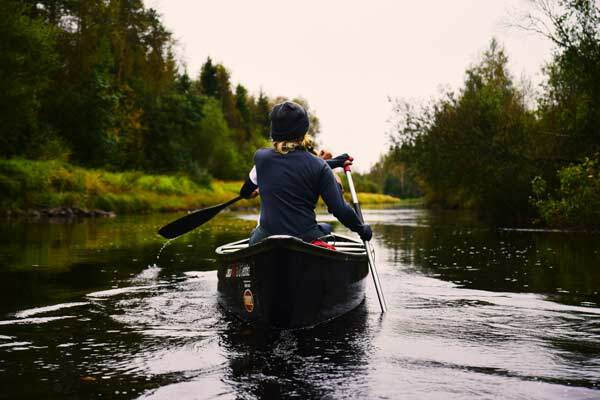 If one person paddles without paying attention, the canoe might go around in circles or veer way off course forcing the other to constantly adjust to steer it correctly. With practice and experience the paddlers become a team, dependent on each other and matched in strokes and rhythm. It doesn’t matter who owns the boat – both paddlers get to enjoy the experience. Living with a home-mate (or two) should be like canoeing, a comfortable paddling that lets everyone enjoy the scenery while headed in the direction you want to go. It shouldn’t matter who owns the home. But it does, at least in the beginning. The fact that one person owns the home, while the other(s) pay rent puts the householder in the power position. The householder controls who lives in the space and sets the standards for the home. (Deb is a good example of this.) This power dynamic is one reason why some people immediately reject the idea of living in shared housing. They don’t want to be in the less-than position. They don’t want to lose control. Others may not be so keenly aware of this dynamic. It lies underneath the surface and shows up as concerns about privacy and agreements. One way to manage this is for home-mates to move into a space that is new to all of them. No one person has more power than the other, whether they are buying together or renting together. This is what Jean, Karen and Louise did when they bought their house together. They wrote a book about it, called “My House, Our House.” Though this option in principle makes sense, the truth is that arranging to own a home with other people is not a realistic option for many people, especially as part of the reason for considering sharing housing is to continue to live in the home that they already have. It’s the householder’s responsibility to manage the power dynamic. And how she manages it will make the difference between renting a room in her house and having a home-mate. Awareness and generosity are key. It’s all about making space for the new home-mate, physical space and emotional space. The physical is easiest to describe. A new home-mate is most likely going to have stuff: furniture, lamps, pictures, pots, pans, appliances, books, all the things that are part of a home. Most of these personal belongings should go in the new home-mate’s space. But what about the kitchen? Is there room for favorite pans, knives, plates? How is the kitchen to be used? In one shared housing situation I heard of everyone had their own plates, forks, knives etc. I’m sure it felt like a rooming house and not like a home. Kitchen use is one of the areas to discuss before agreeing to live together but you might not have explored who has what kitchen stuff. Maybe the new home-mate has a better toaster oven than what is in the kitchen. Is the householder willing to put away hers and have the other one in the kitchen? In a similar vein, are there items that could be incorporated into common living areas? A lamp, a piece of furniture, or art work added to common areas helps to incorporate the new home-mate into the whole house. Creating emotional space for the new home-mate is about welcoming the person and allowing that person to develop her routines and patterns in the home. Assuming the basics have been discussed ahead of time about how the house is to be used, there should be no surprises or need to impose rules on the new home-mate. The first week is very important and has been described in Sharing Housing, A Guidebook for Finding and Keeping Good Housemates. This is a rich time of discovery as you learn how you will live together. Like the paddlers of the canoe, it takes a bit of practice to learn how to live together. Those who have done it before will be more skilled at adjusting, those who have never done it will typically need more time to adjust. It’s good to check in with each other about how it is going. How much the householder charges for rent and utilities is also a power dynamic. The home seeker should feel that she is getting a good deal. Householders should be careful to set a rent that is fair, not greedy, so that money is not a tension between home-mates. (This also widens the pool of potential home-mates.) The rent should always be paid on time. These days automatic payments can make that very easy. Money should not be an issue between home-mates. The householder sets the tone for the home. Sitting in the back of the canoe, she sets the direction of the boat. It is up to her to make space for the person moving in, both physical space and emotional space. It is up to her to set a rent that is fair and comfortable. If she has chosen well, in other words the person moving in is someone she likes and respects whose ways of living at home are compatible enough for everyone to be comfortable, then the question about power should become a non-issue. It doesn’t matter who owns the home, home-mates create a home together, paddling together in easy rhythm. Does this ring true? Have you experienced this power dynamic? How have you managed it? The power issue resulting from ownership of my home by Sharon has not shown up here in two years living together. Reading this I realize that Sharon was clear about the financial arrangement and emotionally set the tone for me to feel welcome. Creating space for my stuff in the shared areas went a long way in helping me feel this is my home too. It is a process for sure and one we love!